NEW YORK CITY — It's not only country cowboys who get to saddle up — city slickers can mosey through urban settings with stables hidden away in nearly every borough in New York City. “They're very shocked. There are horses here not many people know about,” said Michele Mucciolo, a worker at Lynne’s Riding School in Queens who said people head to her borough rather than go to New Jersey or upstate to ride. 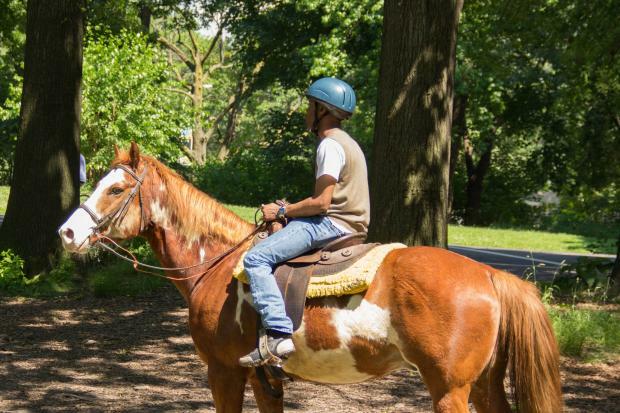 For Chantal Ansah, 22, of Washington Heights, she'd always heard that there were mysterious places to ride in the city, but didn't know where until she recently discovered Brooklyn's Kensington Stables. “I knew that you could. I just didn’t know where,” she said. “You can do anything in New York." She said her interest in riding was piqued by reading a passage in the "Game of Thrones" novels in which a character's steed was described. With the closing of the Upper West Side's Claremont Riding Academy in 2007, Manhattan is the only borough without stables. But a quick trip to the outer boroughs can get riders in the saddle. Lynne’s Riding School: The school, located in Forest Park, does not rent horses for trail rides, but offers lessons for all abilities. Sessions start at $55 for half an hour and $90 for an hour, either on the trails or at the ring near the stables. Evaluative lessons are needed to take advanced courses, Mucciolo said. During summer weekends, lessons book fast, so Mucciolo suggests planning in advance. Aside from lessons, the school also has pony rides and space for kids' parties. Kensington Stables: The stables in Kensington have more than 40 horses for lessons or trail rides through Prospect Park with a guide. They suggest calling ahead of time to schedule a ride. An hour ride, for ages 11 and up, will set you back $37, with solo lessons starting at $34 per half hour. The stables also offers pony rides for younger children. Jamaica Bay Riding Academy: The equestrian center in Jamaica Bay offers lessons and trail rides for a minimum of two people. Appointments are needed for lessons and rides, with prices for a nearly 50-minute ride through the park for two people at $53 and $37 per person for groups. The stables also offer room to board your own horse and facilities for show preparation. Bronx Equestrian Center: The stable offers trail rides and lessons on the bridle path in the large Pelham Bay Park in The Bronx. The center also has more than 40 stalls for New Yorkers to board their horses, pony rides for children and a party room. Trail rides are first come, first served, and no appointments are needed and costs start at $35, a worker said. Group rides of 10 or more need an appointment, and lessons are also available, by appointment, for $40 per hour. Lessons are generally before noon and need either 24 hours notice for trails lessons or five days notice for lessons in their ring. Riverdale Equestrian Center: The Riverdale Equestrian Center does not offer any trail rides, but does have lessons and boarding, a worker said. Lessons start at $55 for a half-hour. Riders are asked give the stables at least a day's notice for an appointment. NYC Riding Academy: The school, adjacent to the footbridge on East 103rd Street, offers individual and group lessons, a camp and workshops throughout the summer. The academy has programs for Western and English riding. The program gives lessons, lectures and teaches barn management, grooming and tacking. Richer Farm: The privately owned Richer Farm, on Sharrotts Road, does not offer individual trail rides, but does give lessons and boarding. Lessons are $80 per hour in a ring at the farm. Owners suggest calling at least a week beforehand. Clay Pit Ponds: While the state’s Parks Department does not rent horses, riders who have their own can use the 5-mile bridle path in Clay Pit Ponds. “The trails are marvelous in a way that they venture through pristine woodlands and beautiful wetlands, certainly a unique experience on Staten Island,” said Randy Simons, spokesman for the state’s Park Department. Trails are open from dawn to dusk, and riders can either trailer their horse or keep them at a local stable, Simons said.